Choosing the right cut for your thin or thinning hair can be a daunting and overwhelming task. To be honest making any kind of change to your hair, big or small, can be nerve racking and make a person sweat with questions. Do I cut it short? Do I grow it long? Will this cut look good with my face shape? While we are all unique when it comes to our physical appearance, your face shape is one thing that you most definitely need to take in consideration when deciding on a cut that is best for you. Unfortunately, not every face shape can carry every hairstyle. Understanding what works best for you is the key to having good looking hair. Here are a few tips to help you decide which hair style is best for you based on your face shape and hairline. You need faith, trust and a little bit of Pixie Dust or how about a Pixie Cut? Tinkerbell may have been on to something because you have to have faith and trust when it comes to a pixie cut. Thankfully with an oval face shape there are a multitude of pixie like cuts to choose from that you can definitely pull off. Here are a few classic, yet modern, takes on the pixie cut that would work well with an oval face. 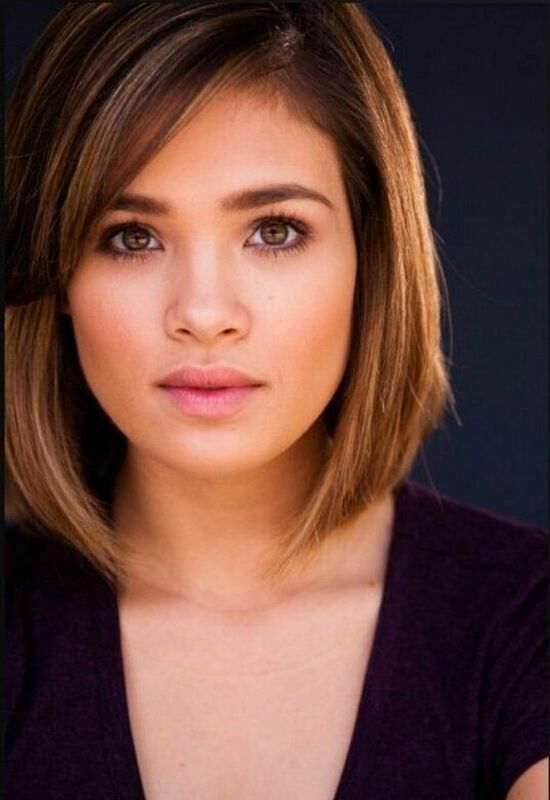 A chin length bob with very light layers that fall around the nose and chin is a great option for you. 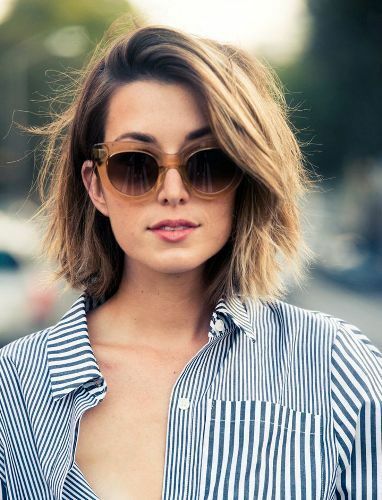 Stray away from any hairstyle that are very short or longer than your collarbone. Instead shoot for something more like the photos below. The World is definitely round, but your cut shouldn't be! A whispy lightly layered cut that falls below your chin is a great option for a round face because layered cuts will give your face more definition and structure. But be careful to make sure you don't go with a look that has heavy layering. This will only make your hair look thinner and make your face look even rounder. 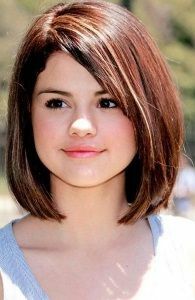 Shine bright like a diamond with a longer bob or cut that's just above the shoulder length. 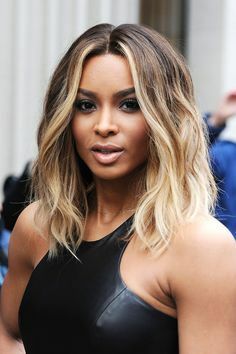 You are one of the lucky few face shapes that can pull off a middle part, so consider a style that has a middle part to help balance our your hair and face shape. Here are a few options to consider. All you need is love... for your jawline! When deciding on a cut for thin hair with a heart shaped face the goal is to emphasis the jawline and decrease the face at your forehead. Consider a short cut or either a shoulder or chin length cut with long bangs that sweep across to one side to help make your forehead appear smaller. Layers around your cheekbone can also add length to your face. Below are a few of my favorite cuts for a heart shaped face. You may have a square shaped face, but your certainly no square! 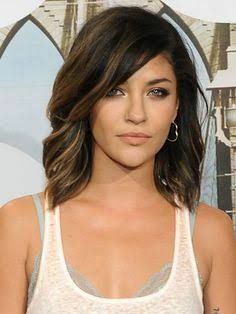 Short edgy cuts like the photos below or loose long bobs with some soft texture are very flattering on you, so be adventurous with your cut. Just make sure whatever cut you decide on that you remember to avoid any cuts that stops at your jawline as they will highlight your square jawline. Where in Indiana can I purchase the shampoo, conditioner, and serum? What salons sell your products? Hi Kathleen! Thanks for your interest in RevuCell Organics. You can purchase at The Green Room Salon. 317-625-6010. Jamie is great at the Green Room and will help you get anything you need. They are able to provide you with all the RevuCell products in your country.